Is Imran Khan a Ray of Hope or a Pakistan Army Pawn? As soon as Imran Khan was sworn-in as the 22nd Prime Minister of Pakistan on August 18, people in the Indian subcontinent started pondering over the following questions. Will the new government under Khan be able to improve the economic and social conditions of Pakistanis? Will he be able to convert a highly corrupt nation on the verge of becoming an altogether failed state, into a flourishing and thriving democracy, expunged of corruption and terrorism? Will his government’s foreign policies succeed in improving the Islamic Republic’s diplomatic relations and trade ties with India? Or will the cricketer-turned-politician prove to be a damp squib and disappoint his supporters? Although the odds are heavily laid out against him, the never-say-die neo-convert and latest entrant to Pakistan’s charmed circle of celebrity political leaders, exudes confidence and seems poised to inject a breath of fresh air in the dynastic civilian politics, allowed to briefly glow like a flickering flame, during brief interregnums of military rule in which the country has been perennially engulfed ever since its inception. Whatever degree of success Imran Khan manages to accomplish in cleansing the Augean stables of corruption, how far he is able to push the envelope in his pursuit of peace with India is a matter of great interest in the regional as well as international politics. This is especially so in view of his country’s heavy dependence on China, bordering on total subjugation, for its economic and military survival and the latter’s blow hot and cold relations with India owing to the availability of a massive scope of trade relations notwithstanding the festering border disputes. India has made its intentions clear that a dialogue with Pakistan is not possible unless the latter improves its record on harboring non-state actors. The snub by India in September by calling off meeting of two countries’ foreign ministers must have made the new Pakistan PM realise that shrewd foreign policy won’t work with Narendra Modi as Prime Minister of India. This is why he recently pinned hope on resuming ties with India after the 2019 Lok Sabha elections. Adding to Imran Khan’s embarrassment was an acceptance by a veteran of his cricket fraternity, Shahid Afridi, who confessed that Pakistan doesn’t merit Kashmir as the Islamic country has demonstrated incompetency in managing its existing provinces. In his very first address to the nation as the newly elected Prime Minister, Khan made haste to extend a hand of friendship and invoked India’s cooperation. He spoke about the need to settle all the disputes between the two countries through dialogue. His if-they-take-one-step-we-shall-take-two speech went well with both the Pakistani and international audiences. The speech was, however, received in India with a mix of customary cynicism and caution as the new Prime Minister had qualified his call for the resolution of all disputes by referring to the “core issue of Kashmir,” a hackneyed cliché used by all the Pakistani rulers and establishments, past and present. As if his lacklustre offer of friendship and peace was already not a blatant rehash of rhetoric resorted to by his predecessors, he was far too economical with crucial issues such as cross-border terrorism, proxy war and ceasefire violations across the LOC to make a mark for himself. In short, his speech was nothing more than a cautious attempt to send a right signal for peace across the border, stopping short of displeasing his own country’s military-intelligence nexus, which has had a stranglehold over the foreign policy and security issues. Devoid of a genuine and bona fide longing for peace, which only a truly democratic leader with a vision, and the unstinting support of his people, like Atal Bihari Vajpayee or Narendra Modi, is capable of articulating with conviction, Imran Khan’s speech was merely a customary rigmarole that every newly-elected Pakistani Prime Minister embarks on. After all, he is anything but a product of circumstances that his country has produced in a toxic political atmosphere of corruption, nepotism, religious fundamentalism, brute military might and unapologetic terrorism supported by the state to establish and perpetuate a religious ideology with its origin in the Gulf, truncated democratic system, totalitarianism, intolerance towards minorities, survival on foreign economic and military aid, unvarnished hatred for India, etc. Imran Khan is the latest of the civilian rulers that the Army has chosen to foist on the people of Pakistan to divert their attention from the economic and political ills of the country, by means of a carefully orchestrated electoral process to perpetuate its hold on the Islamic nation. He has been allowed by the military establishment to talk of a corruption-free economy and austerity measures such as the scaling down of the Prime Ministerial bungalow, reduction of menial staff, auctioning off a fleet of luxury cars in the PM’s establishment, etc. Unfortunately, these are all cosmetic gestures designed to appeal to the layman who has been badly shaken out of his stupor of complacency by the staggering volumes of debts that his country reels under and the alarming speed at which it is sliding down the hill before being declared a basket case or a banana republic. To add some verve to the speech, throw in a talk of peace with neighbours. However, leave the initiative to India, which has time and again declared that its position on the bilateral relations is clear: Kashmir is an integral part of India and its territorial integrity is not a matter for discussion with Pakistan or any other country. Unless Pakistan disowns its policy of proxy war and reins in the terrorists who infiltrate into India, there could no discussions or talks. Pakistan is flummoxed by India’s repeated assertion of its stance and has been trying in vain to find a chink in its armour. Imran Khan’s olive branch is the latest in that country’s series of overtures to make itself look like a peace-loving victim at the mercy of an aggressive neighbour. Hemmed in by the Army of his country and the all-weather benefactor China, how free is Imran Khan to pursue his avowed aim of forging friendly and peaceful relations with India? With the Army breathing down his neck, does he have time on his side? In any case, how serious is he about the resolution of disputes through talks? What was stopping him from even talking about staying off the beaten track of bleeding India, let alone calling halt to the operations of the Army and the non-state actors engaged in shoot and scoot manoeuvres with the Indian security personnel? If consistency is the hallmark of mediocrity, Imran Khan walks away with the credit of being singularly consistent in refraining from putting his money where the mouth is. All he had to offer India at present was the sweet talk of peace that he has done with customary élan. India has sensed the predicament that Khan finds himself in, having been catapulted by the Army to the dizzy heights of power, which is conspicuous by its absence when it comes to delivering on the promises. As the military in Pakistan has a history of interfering in political affairs, majority of the political analysts remain sceptical about Imran Khan being able to function independently without appeasing their agenda. Hence, it may be ominously bad news for India as prime ministers in Pakistan have always been puppets of the military of that country, and Imran Khan is no different. He too has the backing of the Pakistan military. In fact, it is probably the reason that his party, Pakistan Tehreek-e-Insaf (PTI), won the recent elections in the first place. So, as far as India is concerned the status quo shall prevail. Only, they will have to deal with a different political leader, and probably a diverse but insignificant set of personal predilections of a new cricketer-turned-prime minister, who is just another puppet of the Pakistan military that will continue its proxy rule of the country. I believe there is a lengthy cold period between relations of both countries and this is not in favour of India. We are allowing Pakistan time to conspire against India and other countries. Hafiz Saeed is safe in Pakistan and the government has allowed him to roam free. With such a country, India should end even economic relations and stop any trade so that they learn a lesson. Modi has made his stance very clear. He has recently cited state sponsored terrorism as the reason why India-Pakistan talks cannot go forward at this point in time. A country that can jail and oust its own Prime Ministers and Presidents can never be a reliable nation. We must engage US and other western nations in condemning Pakistan’s human rights crisis. Pakistan cannot handle even its 4 provinces and they dream of Kashmir. Shahid Afridi has confessed this fact and many Pakistanis subscribe to this line of thought. Pakistan can never shed its policy of harbouring and training terrorists on its soil. If they can provide hiding to Laden they can do so for any other terrorist. 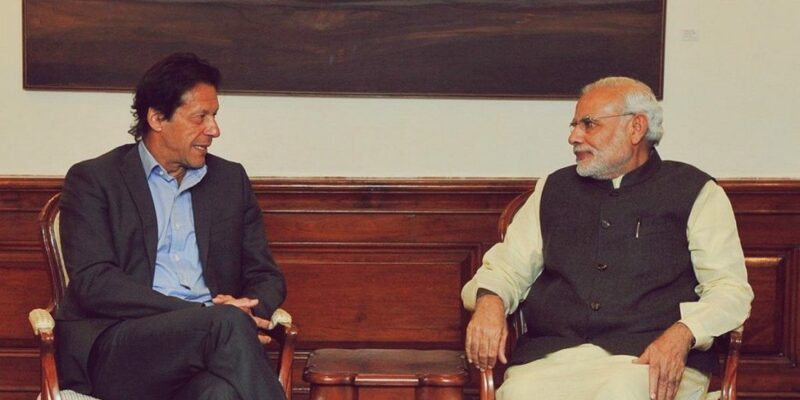 Imran Khan has said that he will look forward to enganing with India after 2019 lok Sabha elections. This means he is seeking a change of guard here and has a clear soft side for Congress and Gandhis. India may have made a heavy mistake by not allowing foreign ministers of both sides to sit and talk over a range of issues. This shows lack of interest on India in normalising relations. India can engage its veteran cricket stars with Imran Khan to have diplomacy on sports as well as politics. Breaking the ice needs some out of the box ideas and involving veterans in this seems rewarding. One needs to understand that Imran Khan is not a seasoned politician. He cannot take any decision solely and relies heavily on Pakistan army and other spiritual leaders.